The chaos and romance of being a short order cook. As announced back at E3 2018, Overcooked 2 is well on its way to an August 7th release. The follow-up to one of our favorite games of 2016 certainly has a lot to live up to, but thankfully, rather than spending our days wandering what Team17 can do to make the game bigger and better, we can watch a couple of new gameplay videos! The first of these is by far the briefer and shows just a few snippets of Overcooked 2's new stages, recipes, and chaos. It also details the "Too Many Cooks" pre-order bonus, which features 5 extra chefs for you to lead around in a frenzied attempt at cooking. The next, though, is a livestream clocking in at just under 42 minutes and shows off quite a bit of the game's four player local co-op. 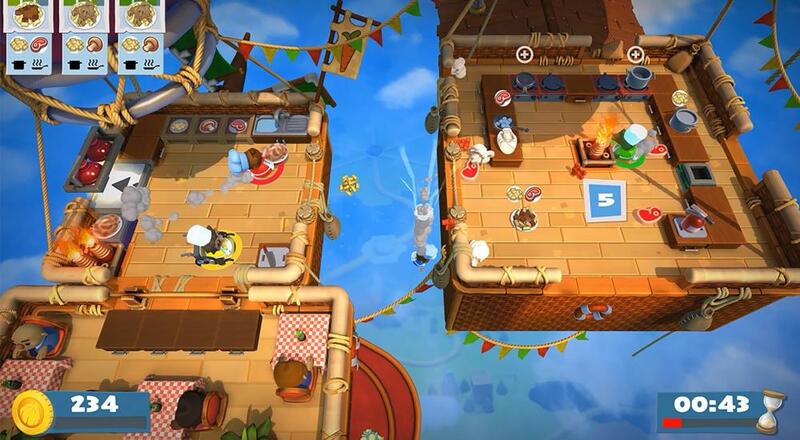 Those without a local crew needn't worry, by the way, as Overcooked 2 will allow four players to cooperate online as well. If the first Overcooked passed you by, feel free to check out our review to get a good idea of just what made it so enjoyable. In case that or the above gameplay videos piqued your interest, you're in luck, as the game will be out on PlayStation 4, Nintendo Switch, Xbox One, and PC in just over a week! Page created in 0.8187 seconds.